← How do solar eclipses affect the weather? It has now been a year since the period of extreme storminess experienced in the UK during January and February 2014. High winds and precipitation, caused by an unusually-prolonged series of extratropical cyclones tracking near to the UK, resulted in widespread flooding, wind damage and, perhaps most dramatically, numerous scenes of extraordinary coastal damage. The causes and impacts of these storms have since been well studied, including work done here at Reading. Such research is made possible by the availability of a large quantity of high quality observations and reanalysis products. However, this has not always been the case. A fascinating question is what can be inferred about historic extreme storm events from the limited observations and data that are available? 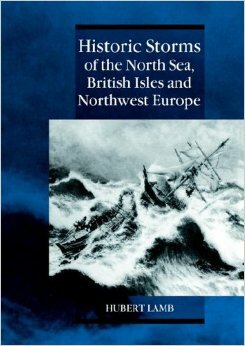 This is the task set upon by Hubert Lamb in the 1980s, and presented in the 1991 book Historical Storms of the North Sea, British Isles and Northwest Europe. A vast collection of observations and personal accounts are collated, attempting to cover all storms with significant impacts in that region during the past 500 years. So what sources are used and what can be inferred about the storms? The earliest storms rely on descriptive accounts only. By their nature they are biased towards cases with significant human impacts, most notably large storm surge disasters around the North Sea coasts. For instance, early in November 1570 a storm over the North Sea caused severe dyke breaches along the continental coast, in what became known as the All Saints’ Flood. Lamb gathers evidence from a variety of sources and concludes that the timing of the progression of flooding along the Dutch and German coastlines suggests that a slowly-moving cold front was responsible for much of the damage. Following the invention of the barometer in the 17th century, surviving land-based records and ship logs are numerous enough that the drawing of basic synoptic charts can be attempted. One such case is the so-called Great Storm of December 1703, the passage of which caused a swathe of damage across southern England and Wales, not dissimilar to that of October 1987. This storm is particularly well-known thanks to the efforts at the time of Daniel Defoe (author of Robinson Crusoe) who used newspaper ads to collect eye-witness accounts of the storm and published them in a very famous book shortly afterwards. Lamb uses pressure readings taken at three locations (Lancashire, London and Paris) by ‘reliable scientists of the day’, together with a number of other observations, to produce daily synoptic analyses for the period – quite an impressive feat! This entry was posted in Climate, Climate change, Environmental hazards, extratropical cyclones, History of Science and tagged extratropical cyclones;historical storms. Bookmark the permalink.